The Global Volcanism Program has no activity reports for Yokodake. The Global Volcanism Program has no Weekly Reports available for Yokodake. The Global Volcanism Program has no Bulletin Reports available for Yokodake. Yokodake lava dome, capped by eight small craters, has been active into the Holocene. The most recent eruption took place about 800 years ago, when ash emission accompanied emplacement of a small lava flow. Yokodake is at the northern edge of the Kita-Yatsugatake (North Yatsugatake) group of stratovolcanoes and lava domes at the NW end of the NNW-SSE-trending Yatsugatake volcanic massif. The basaltic-to-dacitic Kita Yatsugatake group also contains the Tateshinayama, Shimagareyama, Chausuyama and Futagomine volcanoes. Tateshinayama is sometimes known as Suwa Fuji because of its conical profile. A large lava flow forms the Tateshina-kogen plateau south of Tateshinayama and Yokodake. A debris avalanche from edifice collapse in 888 CE created Matsubara Lake on the east side of the massif. Kawachi S, Nakaya S, Muraki K, 1978. YPm-IV pumice bed in Northern Yatsugatake, Yatsugatake volcanic chain, central Japan. Bull Geol Surv Japan, 29: 793-805. There is no Deformation History data available for Yokodake. There is no Emissions History data available for Yokodake. 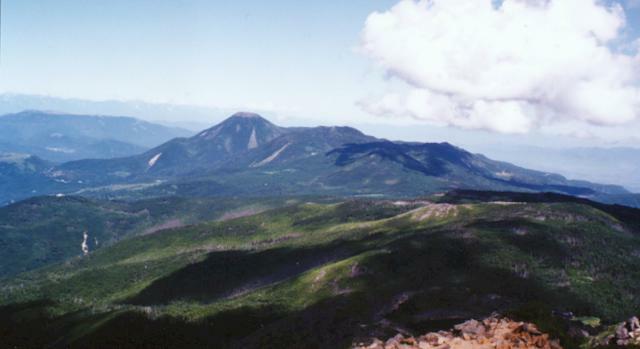 The Kita-Yatsugatake (North Yatsuga-take) volcanic group is seen here from the summit of Tengu-dake to its south. Conical Tateshina (left-center) is a part of a group of stratovolcanoes and lava domes at the NW end of the NNW-SSE-trending Yatsuga-take volcanic massif. The broad forested slope in the foreground is Naka-dake, and the flat-topped peak to the right of Tateshina is Yoko-dake, which last erupted about 800 years ago. Popular hiking trails extend along the axis of the Yatsuga-take volcanic chain. There are no samples for Yokodake in the Smithsonian's NMNH Department of Mineral Sciences Rock and Ore collection. IRIS seismic stations/networks Incorporated Research Institutions for Seismology (IRIS) Data Services map showing the location of seismic stations from all available networks (permanent or temporary) within a radius of 0.18° (about 20 km at mid-latitudes) from the given location of Yokodake. Users can customize a variety of filters and options in the left panel. Note that if there are no stations are known the map will default to show the entire world with a "No data matched request" error notice. Large Eruptions of Yokodake Information about large Quaternary eruptions (VEI >= 4) is cataloged in the Large Magnitude Explosive Volcanic Eruptions (LaMEVE) database of the Volcano Global Risk Identification and Analysis Project (VOGRIPA).